I would like to make my felted bear nose shinny and hard. Has anyone done this and what did you use? I'm thinking about trying some wood shellac? Any thoughts or help would be appreciated. I do have some wax but I didn't want it to soft. You could try with polyvinilic glue. It would be hard but slightly flexible. I have used it to harden cat noses. It is slightly shiny, white when you apply it but dries transparent. You can dilute it with water so that it goes deep in the needle felting. You might give it a try on a needle felted ball, to see if you like the result without compromising your nose! I've never heard of it but I'll see if I can find some. I'll Google it! Why not give it a try (on a test piece of course ) and tell us about the result? Thanks for the suggestions Elli! I have some Mod Podge and of course nail polish! You always know that TT is the place to get ideas that you weren't thinking of! Testing will start this weekend!! I hope it works out for you, I'm looking forward to your report! I'd love to hear how your esting goes. I've not had much luck making felted noses shiny. I've tried Mod Podge, varnish and wax but usually end up with a spikey mess. Yes, be careful of the spiky mess. Unless you are planning to sand I would make sure that your needle felting is very smooth a tight. Trim of any flyaways of bumps, anything you put on that is shiny will make them very noticeable. I like mine dull, so I use Modge Podge Mat, but for shiny you can use the gloss. What I do is wet the nose first, I tap water into the felt, then I dilute the Modge Podge with water about 50/50 for the first coat and I tap it down into the felt. What that does is make it all become one with the felt, it is not just laying on the top. I do this several times, letting it dry in between. I do sand in between but you do not have to. 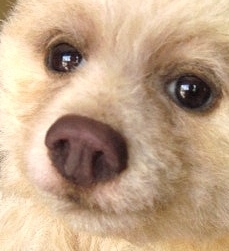 Someone told me once that had Modge Podge go white on a nose when used full strength in the humidity, so I do not use it straight. It has never happened to me. There are other sealers too, PVA glue can be used, but it is a little different than Modge Podge, Modge Podge is glue with a sealant in it. I would be very careful with nail polish, it will just lay on the top and the underneath will still stay soft. When I make a nose the way I do, it is not hard, it actually feels like an animal nose, it is very firm with give. Here is a Modge Podge nose that has been sanded and painted. To make it shiny I would finish it with a coat of acrylic gloss. That nose is amazing! It looks soooooo real! I do have the mat finish Modge Podge at home so I will try that first and neddle felt a harder nose. I love TT and that everyone is willing to share their techniques and success! The weekend should be interesting! Mo Beary, did you experiment over the weekend??? Hi Boo Boo! I didn't get a chance this weekend had the grands kids and a very sick little dog all weekend! I'm going to have to do some more felting to get the nose tighter before I try. I picked up some Modge Podge today at Micheals so hopefully I will give it a go in the next week or so. Sorry to hear the little fuzz bucket was ill . I know how taxing that can be. Hugs! I've tried a few techniques and I've not liked one of them. Very frustrated. I'm not sure if I should have put more coats of modge podge on. Joanne if you're out there can you jet me know how many coats of modge podge you suggest using. I think I put 3 coats which I'm thinking maybe isn't enough. Wow, Joanne, thanks for the amazing tips! I've just started experimenting with undiluted gloss mod podge and I'm not happy with the outcome. Yup, it brings out the bumps, and little spiky bits are all poking through even after sanding. 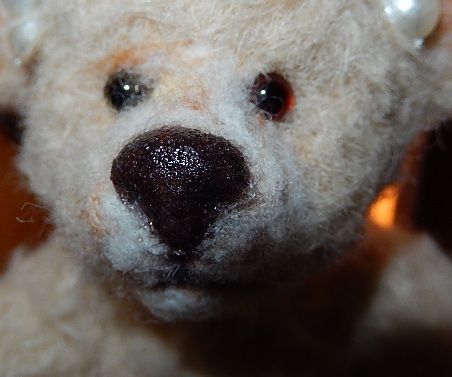 For my next bear, I'm definitely watering it down first (and needle felting until the nose is much stiffer!). 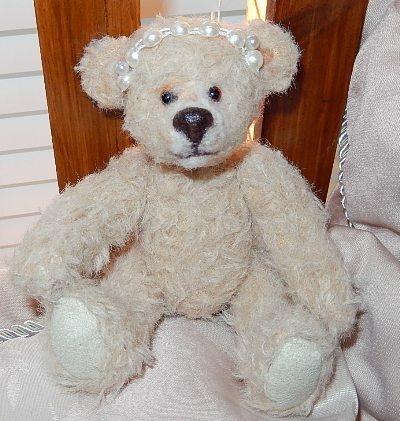 Zhennijen, your bear is adorable!! I am sorry it took me so long to get back here. Mo, I must use 7 or 8 coats. It is the sanding in between that I think is important to not see the bumps. You need to get rid of them to not see them. I don't sand the first couple of coats. I start sanding when it is stiff enough that I can sand. As you sand you can see the unevenness, The next coats help to even that all up. Remember just like painting a room, that glossy shows imperfections more that flat. You may want to try a satin finish for just a little sheen. Jennifer, your bear is very sweet.